JAL Suite seat 2A in upright position for takeoff and landing. Finally we get to the JAL First Class seat. At that time, the JAL Suite used on the Tokyo Narita (NRT) - New York JFK (JFK) route was the latest generation long-haul product. It was first rolled out on August 1 2008 on the JFK route and is based on the Venus seat manufactured by Contour, with JPA Design putting in the finishing touch. 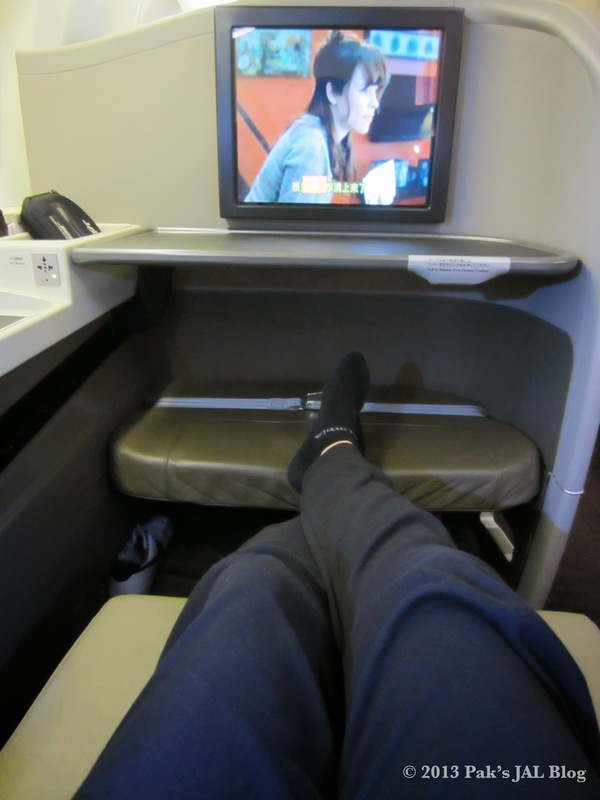 Sadly by the time I post this trip report, the JAL Suite on the JFK route has already been replaced by the latest New JAL Suite, which is part of the SKY SUITE 777 (SS7) cabin that JAL progressively rolls out. There are not that much functional differences between the two JAL Suites given the new one is just an incremental update with a more luxurious look and bigger personal TV. Having tried both the old and new JAL Suites (Yes, I was able to try out all 4 classes of the SS7 seats recently on a short flight and there will be a trip report "soon" :P), I would be happy to fly on either of them. JAL Suite has a very generous legroom as one would expect on an international first class seat. JAL Suite has a generous seat pitch of 211 cm (83 inch) and a seat width of 59 cm (23 inch). While it is not the widest seat in the industry, it is more than enough for most people. You will get more legroom than you ever need! I couldn’t reach the ottoman without moving my seat not matter how hard I tried. When turned into the bed position, the armrests will be lowered at the same time resulting in a wider 84 cm (33 inch) by 199 cm (78.5 inch) bed. (Yes, the new SKY SUITE II on SKY SUITE 767 (SS6) is 1 cm longer than the JAL Suite LOL) What I really like about the seat (or should I say bed?) is that it is a rectangular shaped suite. This means the entire bed from head to toe has the same width. This is important as I like to sleep on my back instead of sideway. However I am not against having a triangular suite as long as the bed is wide enough in the leg/feet area. I got really annoyed if my feet are pushing against the walls while there is so much useless room around my shoulders. Luckily JAL Suite has no such problem! 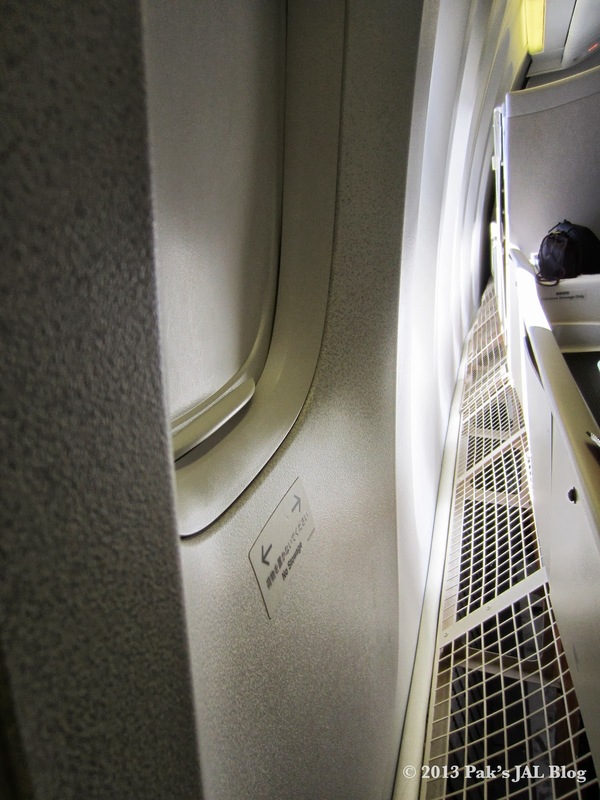 Gap between JAL seat enclosure and the wall. The W82 configuration seat map above seems to indicate that seats 2A and 2K are bigger than seats 1A and 1K due to the curvature near the front of the fuselage. But I found it to be a bit misleading. The seats on the seat map includes unusable gap between the seat enclosure and the wall. It is actually that gap that gets narrower and not the seat! And you can’t even store anything there. So basically don’t select the 2nd row window seats and expect a bigger seat. 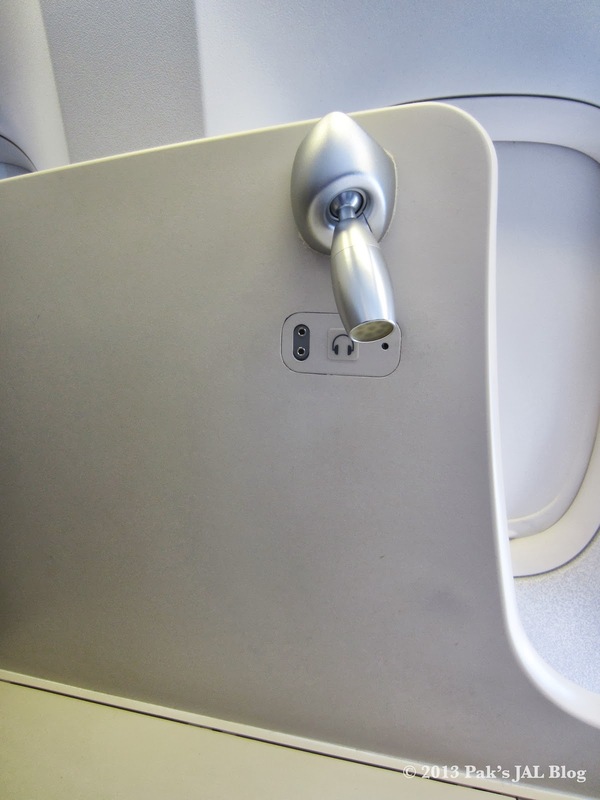 Every seat is also equipped with a 48cm (19 inch) personal TV screen. However it is not a widescreen TV like most TVs are nowadays. JAL Suite was first announced in June 2008. I guess widescreen TVs were not as popular as it is now when JAL worked on the design a year or two before that? 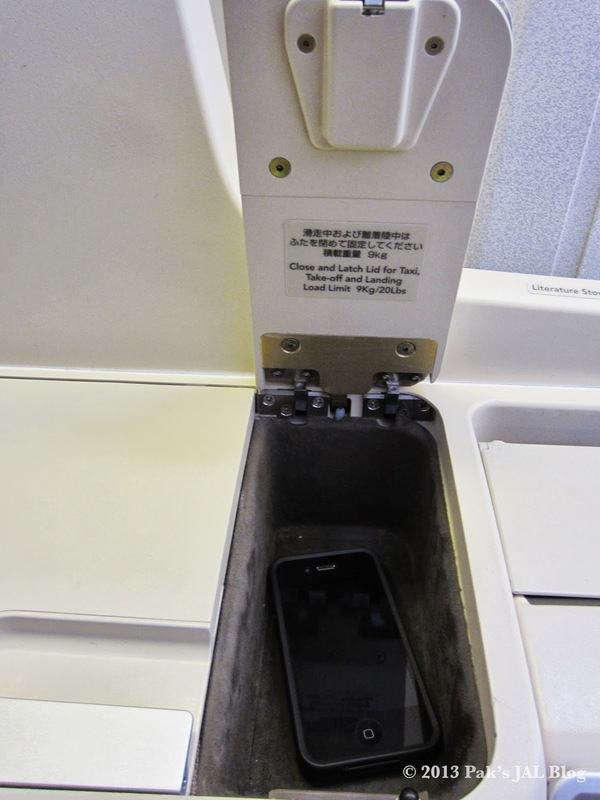 But at least JAL finally fixed this in the latest revision of the New JAL Suite on SKY SUITE 777. On the other end of the seat you will find an ottoman and the adjustable table. During takeoff and landing you can store your carry-on luggage underneath the ottoman if you don’t want to store them in your overhead bins. You can also find a compartment for shoe storage underneath the ottoman on the wall. As you can see, the ottoman also comes with a seat belt. This is because it could be used as a guest seating as well. Just slide the adjustable table towards you and your guest can sit comfortably in a seat that’s as wide as your bed (another advantage of having a rectangular suite!) while he/she chats or dines with you. However, it could be a bit small for two people to dine together though. To move the table, you would have to release the catch under the table. With this sliding table design, it is very easy for you to get out of your seat even during meal service. So you don’t have to worry about knocking over your glass of champagne when you want to visit the lavatory in the middle of the long meal service. 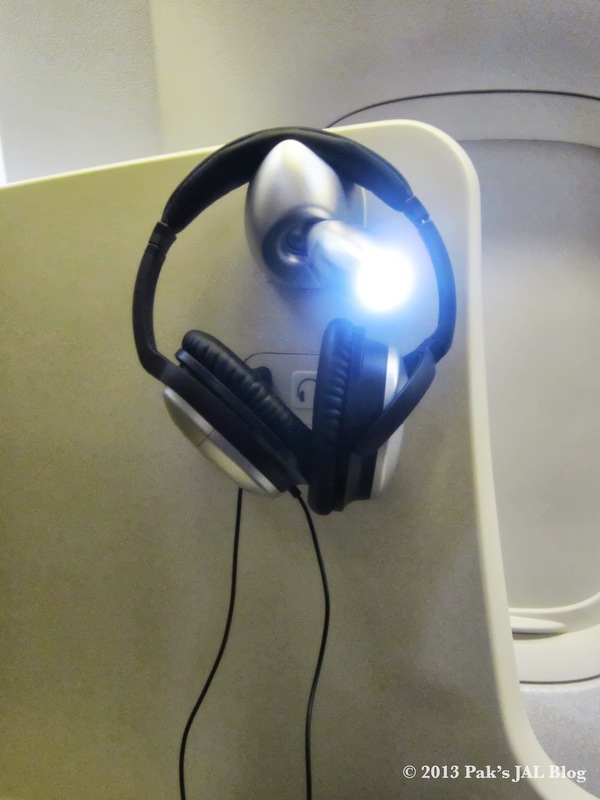 There are 3 sets of reading lights for each First Class passenger. 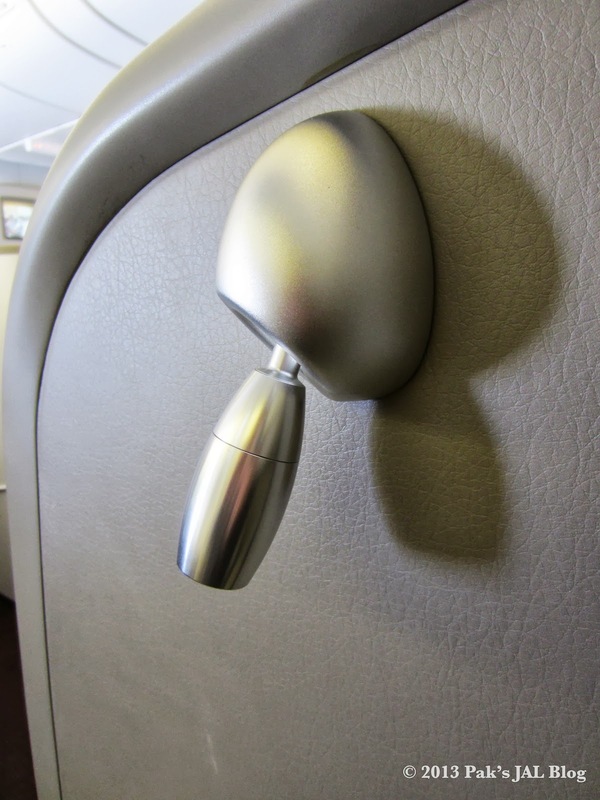 Two of them are located on seat enclosure near your shoulders, one on each side. You can adjust the angle and brightness of these reading lights. To adjust the brightness, just rotate clockwise and anti-clockwise. There are a total of 6 brightness settings. However, these two sets of LED reading lights are shaped differently. This is because the non-aisle side one can be doubled as the headset holder. The headset plug is actually located right next to the reading light. 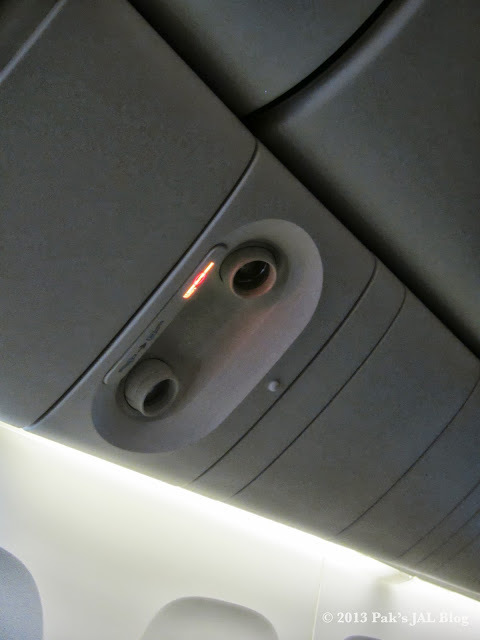 So it is very smart of JAL (and JPA Design) to design the reading light so that they can kill two birds with one stone. There’s a table next to the seat which I like putting snacks and drinks there, especially a bottle of water. So I can easily access them even when I got a bit thirsty after I woke up. The large-sized briefcase compartment has a load limit of 9kg. You can find a compartment for large-sized briefcase right next to your seat. It can hold up to 9kg of load. There’s a net pocket inside if you wish to store smaller items there. My 15 inch Macbook Pro briefcase fitted perfectly in this compartment! Storage for glasses and small items. Storage for glasses and small items can hold up to 9kg of load. 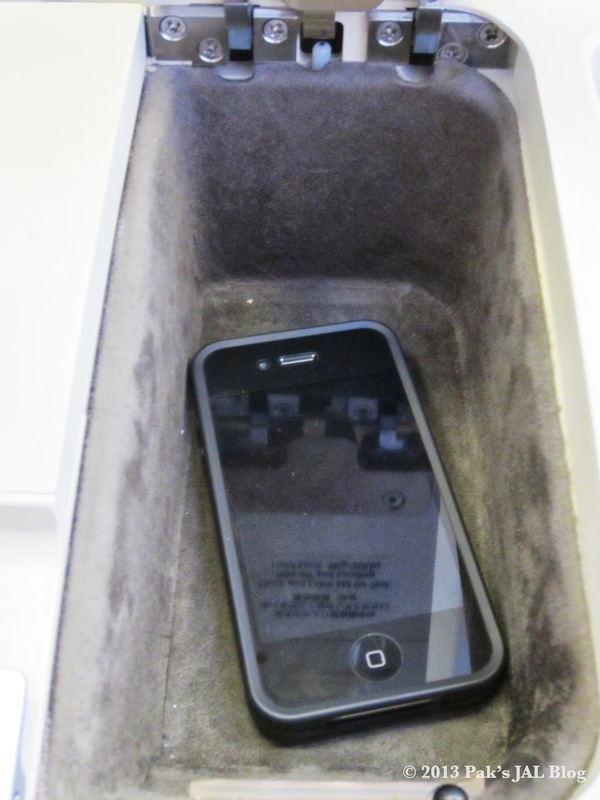 iPhone 4 in the small storage compartment. Right next to the large-sized briefcase compartment is a separate one for glasses and other small items. Just like the bigger compartment, it could hold up to 9kg of load, which is more than enough for this small compartment unless you want to put some heavy rocks there LOL. Other than storing glasses, I found it useful to put your phone there as well (unless you have one of those gigantic iPhone copycat phones). You could also find a magazine storage right next to the seat control. It is only big enough to store 1 – 2 magazines. But I believe JAL designed this for you to hold your menu folder, which fits perfectly in this storage. Literature, slipper and small item storage areas. Can’t store items here during takeoff and landing. Next to the sliding table is storage for reading materials, safety card and slippers. There’s also more space to store small items. However since there’s no cover, you won’t be able to use this during takeoff and landing. The universal AC power outlet is also located in this area. JAL Suite offers a very private space for each passenger. Above is a picture taken while I was sitting in my seat. As you could see, the JAL Suite offers quite a bit of privacy for each passenger. I could hardly see what other passengers. So this is perfect for solo travelers. Partition between the center seats could be lowered electronically. Center seats are perfect for couples who could talk easily without leaving their seats. So how about when you are traveling with a companion? Well JAL has that covered as well. The partition between the middle seats could be lowered electronically. There’s a button next to the partition. Just press the down button to lower the partition and up button to raise it. 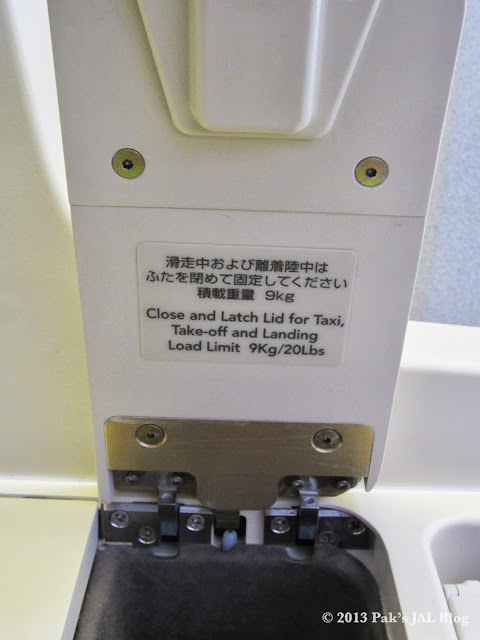 By default, JAL lowers the partitions. Interestingly, in the seat manual, it says “Please call the cabin attendant raise/lower the partition”. I guess that is to avoid the situation where one wants it lower while the other wants it raise? JAL has the exclusive rights to use Tempur products onboard. Tempur pillow is used as lumbar support. When you board, a Tempur pillow is already placed in your seat with a blanket for you to use as lumbar support. The cushion also doubles as one of the pillows during turndown service. JAL adds a Tempur mattress pad and an extra pillow when turndown service was requested. As part of the turndown service, the cabin attendant will put a Tempur mattress pad on top of your seat and give you an extra pillow and duvet. The memory foam mattress pad is simply heavenly! You won’t feel about bumps on your bed at all. On top of that you get the perfect neck support with the Tempur pillow. It rivals the beds at some of the 5-star hotels! Due to the location of the adjustable table, if you are tall enough, part of your seat will be underneath the table. But I definitely did NOT feel that my legs were confined in a tight space at all. In fact, if you take a closer look at the photo above, I didn’t even slide the table all the way to the front. I left a gap to put my laptop briefcase there too! The attentive cabin attendant will make your bed every time you get up. Seat controllers for the JAL Suite. There are two seat controllers located on the non-aisle side of your seat. What I like about the seat control most is the one-touch buttons for the 3 pre-set positions conveniently located on the edge. This way, you can convert your bed into an upright seat or seat in the lounging (or relax) position with the press of one button without getting up! You don't have to keep pressing the bed button to turn this into a bed, just hit the bed button once! And you can hit stop at any time if you found a position you like and don't want to adjust further. JAL Suite in pre-set "Relax" position. And of course, other than the 3 pre-set positions, you can also use the main controller to adjust the seat freely. On the left from top to bottom are the buttons to tilt your headrest (vertical adjustment are done manually, yup, just pull the headrest upward with your bare hands :)), adjust the seat back, leg rest, and finally moving the seat forward and backward. Move the seat forward to use the ottoman as a footrest. You can see the shoe storage compartment from this picture too. Being able to move the seat forward and backward is actually very important when you have a big seat like this. If you are in the middle adjacent seats, you can move your seat forward and easily talk to your companion. Otherwise, you would have to lean forward and get tired really soon. Another reason you would need this is you have too much legroom. Unless you are Yao Ming, you probably wouldn't be able to reach the ottoman as your foot rest. On the right hand side, it is the controller for lumber support. If you want a massage, just press the button in the middle, the upper and lower cushions will expand and deflate repeatedly. But if you just want to adjust the lumbar support, you can do so by pressing the purple buttons with an arrow on it. The ones pointing up and down are to adjust the upper and lower cushion respectively. If you want to adjust both the upper and lower cushions at the same time, use the one pointing to the back (or left) to deflate the cushions and the one pointing to the front (or right) to expand them. Underneath the lumbar support buttons is the foot light button. You will need this if you somehow need to find your shoes in the dark and don't want to use other lighting :) And of course these buttons glow in the dark so you can see them after cabin lights are dimmed. JAL Suite MAGIC-III controller for the inflight entertainment system and menu storage. Next to the main seat controllers is the controller for MAGIC-III, JAL's inflight entertainment (IFE) system. I like how there's a hole in the cover which you can perform most of the controls without lifting the cover. The only control buttons that aren't accessible are screen brightness, menu, language, and the four buttons for gaming.